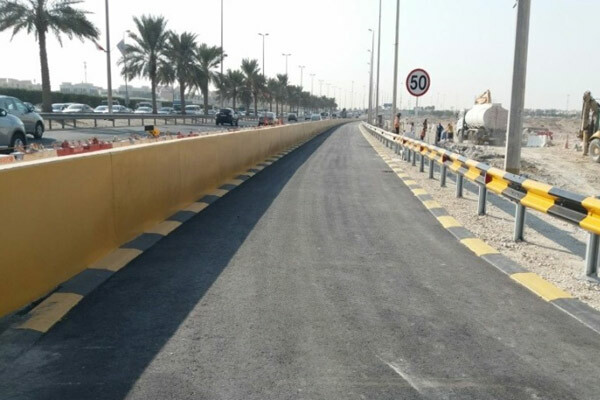 Bahraini authorities said work has been completed on the exit from Buri village towards Shaikh Khalifa bin Salman highway and also the creation of a right-turn lane at Wali Al Ahd roundabout leading to the southern end of Shaikh Khalifa Bin Salman Avenue. Both these projects come as part of the comprehensive strategic plan of mega road network projects, said a statement from Ministry of Works, Municipalities Affairs and Urban Planning. The scope of work included excavation, soil compaction, ground canals for future use, construction of rain water drainage network, pavement asphalting works, bricklaying, traffic warning signs, land line painting, all traffic safety requirements, protection and shifting of obstructive services on the roadside as well as street lighting works, it stated. The speedy implementation comes following the directives of HRH Prince Salman bin Hamad Al Khalifa, Crown Prince, Deputy Supreme Commander and First Deputy Prime Minister, to find prompt solutions to alleviate traffic congestions and enhance traffic flow in various regions in the Kingdom, it added. Essam bin Abdullah Khalaf, the Minister of Works, Municipalities Affairs and Urban Planning, said these two projects come as part of the comprehensive strategic plan of mega road network projects. "One will provide a right turn at the Wali Al Ahd roundabout leading to the southern part of Sheikh Khalifa Bin Salman Avenue as well as the creation of right-turn lane to divert incoming traffic from the west direction on Wali Ahed Avenue to Shaikh Khalifa Bin Salman Avenue south leading to Zallaq," stated Al Khalaf. "The project aims to alleviate the traffic congestion on Wali Al Ahmed roundabout and serves the inhabitants of Hamad Town and Buri village heading towards Zallaq as well as the incoming traffic from Hamad Town towards Riffa," he added. The project is expected to improve the roundabout service level and alleviate the delay ratio on the entire intersection by 10 per cent. The project will also ease the traffic flow on Wali Al Ahed Avenue opposite Block1204 and reduce the vehicles delay and waiting queues by up to 25 per cent, said the minister. The Buri village exit will help alleviate the traffic bottlenecks in the area, and create a new exit for the inhabitants and facilitates movement and fulfill inhabitants’ aspirations to enhance their accessibility to the commercial and residential facilities in the area and to alleviate the traffic congestions on the available exists during peak hours, he stated.